Véronique Piaser-Moyen is a self-taught artist from the world of photography. 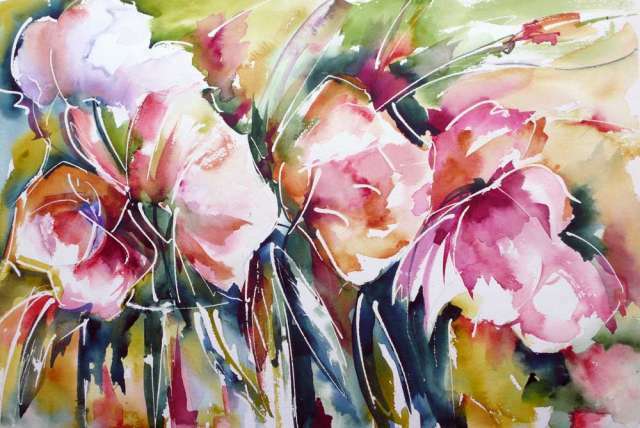 She presents works where a hidden life abounds behind the mystery of her flowers. These flowers are her personal challenge as she had vowed never to paint any, for fear of falling into preciousness and sentimentality. However, after seeing Blanche Odin's work which revealed a strong and vigorous style, she embarked on this difficult task: the representation of flowers. She made experiences, attempted innovations, and sought her own style. To bring out the colors of the tube, without distorting them, to throw them on the wet paper. To explore and master the union of pigments, their mixed marriages, the birth of imaginary fusion. She takes into account her stories of flowers that reveal unexpected osmosis and gives an ultra-dynamic version where one's eyes are captured by the force of the lines. She takes us into her world of colors and harmony which she offers us as a gift.